The engine control system is based on Megasquirt. It's an aluminum box with 3 blinky lights and some wires! (the 9 pin plug with nothing plugged is for a wire to update the data in the box by plugging in a laptop computer). 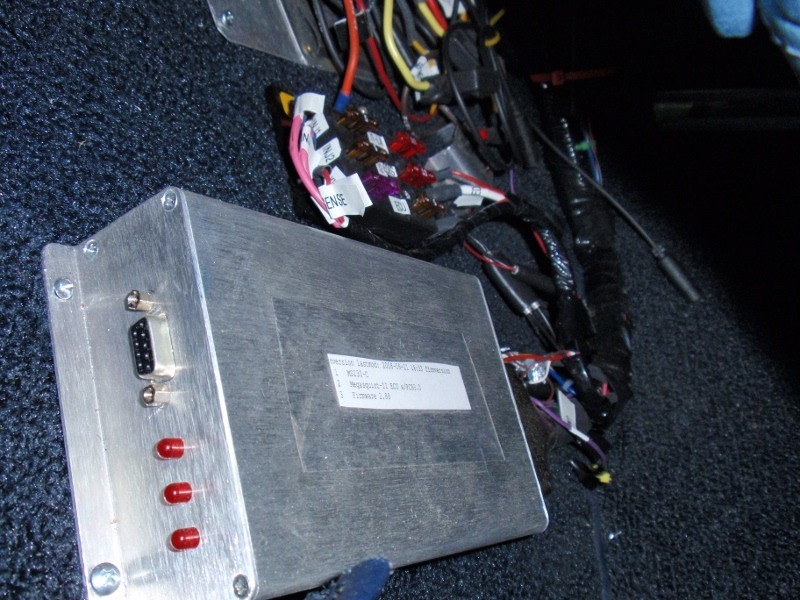 The box controls fuel and engine spark timing. Many people use Megasquirt and there is a gigantic amount of information on the web and many forums. It's a system that costs very little but does demand you learn a very great deal! Cams reground by Elgin Cams to Sprint specs. Cams very carefully set to exact factory cam timing using those offset dowels the usual suppliers sell (mine from Bean). Higher pressure oil pump. Like Kamp engines this one is around 60 PSI. Regrettably, I left the flywheel standard weight. Exhaust is a 4-2-1 design with large diameter into the muffler. A design from Dave Bean. The source of (at this writing) the most recent Megasquirt control (msq file), the one I use, is megasquirt201208050937ase2pctb.msq. Feel free to adapt this to your needs. Hope it helps. You are going to spend a lot of time at www.megamanual.com. On the one hand it is chock full of really essential information. On the other hand there are a few places where the information is wrong. Or misleading. Or obsolete. Do not get discouraged. The various Megatune forums will rescue you. It's also very helpful (meaning time-saving for you) to know someone else local doing something with Megatune. You are going to need to buy stuff. While Megatune has multiple suppliers that are authorized (and therefore recommended) I used diyautotune.com and recommend them highly. The web site was easy to use and they were very responsive. Now just because I said the web site was easy to use does not mean your first visit is going to seem all that simple. You do have choices to make and as a beginner you will not find them easy to make. There is lots more to say, but it is really boring unless you are a Megatune user. Go here to see the gory details about my setup and my mistakes. The simplest way to get Megasquirt and your spark plugs to work together is to use a Ford EDIS system. EDIS reads the crank sensor (really a flywheel sensor) signal and turns that into signals that fire the spark plugs. A couple wires from EDIS to Megasquirt give Megasquirt control of the plug firing. Notice (on engine pictures) that my coil pack has two coils and 4 spark plugs (it may not be obvious in the pictures, but it is true). With Ford it is typical to have 2 plugs for each coil. Edis fires both plugs on each coil at the same time. This wastes the electrical power firing one of the spark plugs but is otherwise harmless. It's called a 'wasted spark' system because, well, because every time a coil fires one spark does something and the other fired-spark is on a cylinder with no fuel in it and that firing is wasted! Of course fuel is essential :-) Fuel injectors need to be approximately the right size for your application. If they flow too little fuel you will not be able to generate good power or to safely (safely for the engine) operate the engine at wide open throttle. if the injectors are much too large you (meaning Megasquirt) will not be able to control them very well at idle or slow running. For a 2.0Liter Zetec that is planned for 200HP at the flywheel each injector should flow about 310 cc per minute. Really useful information on injectors as well as a service to clean your injectors and measure them is available at Russ Collins Engineering www.rceng.com. I recommend you visit the site for more information. Even brand new injectors probably have junk left in them from the manufacturing process and handling in shipping. I was not even sure what fuel flow my injectors had, so not only did cleaning of the new injectors (by rceng.com) tell me the flow rate, but it improved the flow (yes, they were slightly dirty somehow). The Ford pickup is thru the rear of the engine(left rear side) to fingers on the flywheel. The distance from the pickup to the fingers is crucial. Ford says it has to be 0.030 to 0.060 inches (but check your Ford documentation, don't just accept what I say). I was using stock Ford parts but had to do a tiny bit of modification to get the distance in the useful range. If you are outside this range you will get nothing. If you reverse the wires to the sensor you get nothing. If you ground the wires you get nothing. A direct way to look for a signal is with a lab scope. A nice one is an OTC3840 from, for example, Kenzo.com. it knows about vehicle electronic devices like sensors, and also knows about traditional points/coil systems, so it's relatively easy to use. However I figured out the distance was wrong by running Megatune, which said there was no crank signal. Which I figured out meant a bad sensor placement. Of course this took days, not moments, to figure out. If you use the GM sensors that the MegaManual suggests you really don't have to do much but wire them up, Megatune knows how these respond to temperature (meaning megatune knows what voltages mean what temperature). Megatune is software you run on a laptop. Unless you are tuning your car (and I rarely do that now) you will not use a laptop or this software. It is free and is the standard software to set up and update your Megasquirt ECU. It is also a logger. That is, you can turn on logging and drive your car while recording all that the engine control system is seeing and doing. Then after you stop the logging you can see a graphical view of the data using MegaLogViewer (the log is a simple ASCII text file, if you care to look at it...). Megatune is for Windows, but modern GNU/Linux can run it just fine using Wine. Megalogviewer is software you run on a laptop. Unless you are tuning your car (and I rarely do that now) you will not use a laptop or this software. It is not free (but it is inexpensive). It is very useful while you are tuning. It reads the logging data Megatune can create. Megalogviewer is Java and runs fine on Windows or GNU/Linux. Given a valid msq file (the one used with a log file (a .xls file)) load megalog viewer with the .xls. Then over at the right where the VE table is find the button to load the right msq file and load it. Then click the analyze button and you will get suggested changes to your VE table (see the Megamanual)! Just what you need! With practice you will decide to not slavishly follow the advice of the megalogview analyzer. But it is a really good way to get started tuning.